Quiet Alaskan Log Cabin In The Woods. Quaint 2 bedroom, 1 bath cabin. Welcome to a little piece of Seward, Alaska. Located in the beautiful thick forests of the Lost Lake Subdivision, home to the famous Lost Lake Trail. Our locally milled log home is your base camp to miles of trails, hundreds of miles of ocean, or just a few feet to your own back yard fire pit with a book. 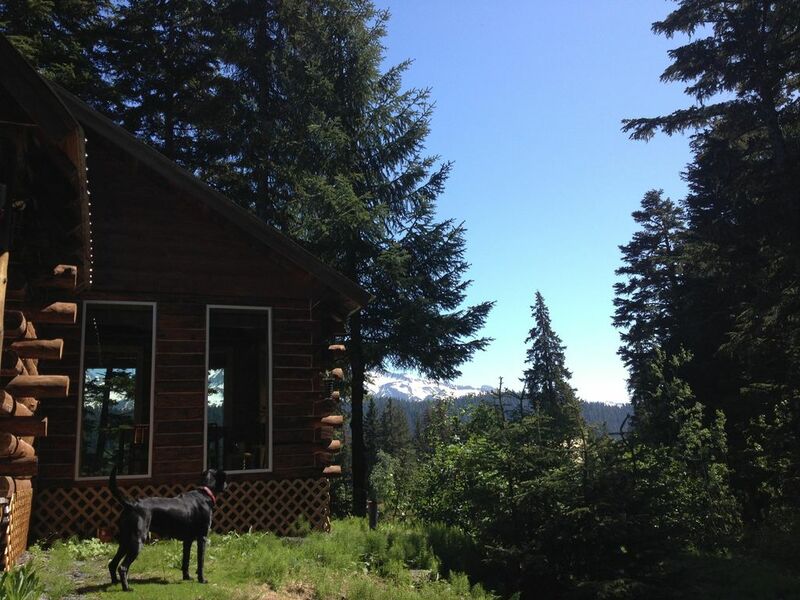 cabin sits on a private 1.5 acre lot. Please read our "Reviews". Lost Creek Cabins AK is truly the best place to stay in Seward. ~two private rooms each with queen beds located up stairs. ~one queen sleeper sofa located on main floor. ~We require full payment to reserve the cabin. ~The nightly rate is based on 2 people.Each additional $40/night. ~First 2 children under the age of 5 go free, any additional kids or persons over age 5 will be additional person fee. ~Please include in the inquiry if you are bringing pets. ~Pet fee is $30/2 dogs, $10/each additional dog. - Full refund minus $25/fee if you cancel 30 days prior to the check in date. -50% refund in canceled between 29-15 days prior to check in date. Owner is born and raised Alaskan. Shower with tub, sink, and toilet. A beautifully decorated cabin which combines the best aspects of rustic style with modern comfort. You will not be disappointed! Very close to hiking and town but far enough away for a nice quiet stay! My family and I had a fabulous stay at this wonderful cabin in the woods. Clean, quiet, and perfectly stocked, this property had everything we needed to enjoy a few days away from home. I particularly enjoyed having my afternoon coffee on the deck. Thanks Julie for the hospitality and letting us enjoy this gem!! Cabin is exactly what I was looking for. Host provides a detailed introduction to cabin, amenities, and local attractions. With multiple bedrooms, comfortable dining, and living area as well as a full kitchen this place is like home away from home. Will definitely be staying here again in the future. We loved staying at the cabin for the weekend! It was so clean and cozy. Very well taken care. Close to town for easy access, but tucked away for a private, quiet stay. We will definitely visit again! Fantastic property in great location, set back a little bit with plenty of peace and quiet. Great wood stove with plenty of wood to burn. Fully stocked kitchen. Found some good books to read around the cabin. Cozy common areas with lots of room for gear if you’re the outdoor enthusiast. Close to Kenai Fjords, backcountry skiing and downtown Seward. Lost Lake Trail head is just a short warm up walk down the road from the cabin (15 minute walk). Cabin is located 3 miles from Seward Small Boat Harbor where all the Charter and Tour Boats are located. -Full payment to reserve the cabin. -Nightly rate is based on two person occupancy. Each additional $40/night -2 kids under 5 years of age go free. Each additional will be concidered extra person. -Full refund minus $25/fee if canceled 30 days prior to check in. -50% refund if canceled 29-15 days prior to check in. -$25.00 Pet fee for the first two pets $10/each additional.